AdBlue Emulator V4 EVO NOx compatible with Scania R730 EURO 5 trucks and can’t be used for other truck series or vehicles made by other manufacturers. 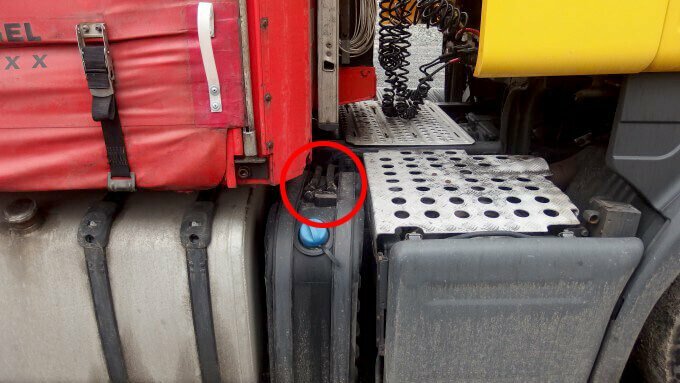 This installation manual describes all steps necessary for correct AdBlue Emulator device installation on compatible Scania R730 EURO 5 vehicles. We highly recommend you to delete all DTC (Diagnostic Trouble Codes) errors from OBD (On-Board Diagnostics) system. The best option is to use Scania VCI 2 or Scania VCI 3 diagnostic scanner. 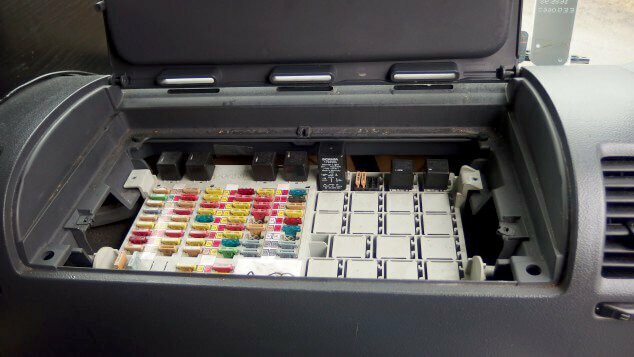 If you noticed new OBD DTC errors after installation, please check the system again with the diagnostic scanner. There might be errors related to incorrect installation. For the safety reasons we highly recommend to start the installation by connecting a ground wire. This emulator doesn’t require an additional programming or learning and we sell it ready to use. 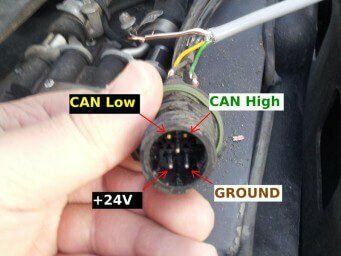 First of all you need to to locate the CAN line behind the OBD connector. 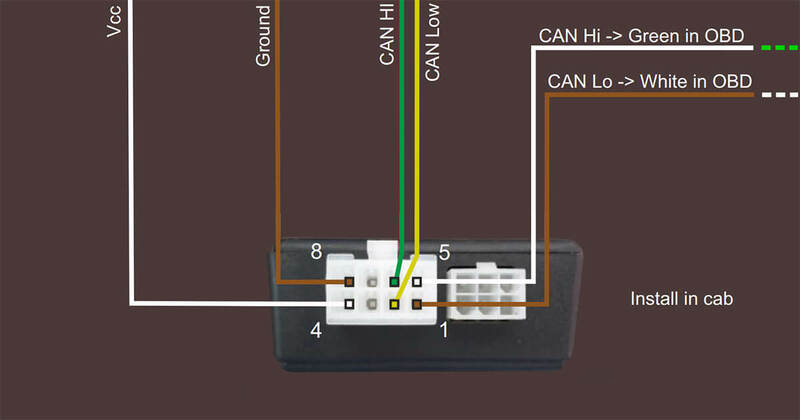 This CAN line comes by the two-wire pair (CAN High – green wire, CAN Low – white wire). Now you need to connect CAN line of the emulator to this CAN line on the truck (do not cut wires, just connect). Now you need to drag the four wire cable of the AdBlue Emulator to the rear part of the cabin. You can see the most optimal route to drag a cable. 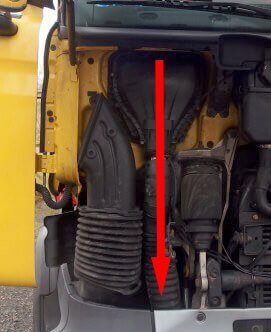 As you can see the best route is to drag the cable from the junction box, through the wire tube on the front of the truck. Then it should be dragged to the rear side of the cabin right to the SCR system plug. 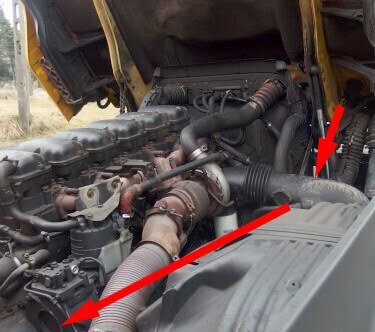 Now you need to locate the SCR (Selective Catalytic Reduction) system plug at the rear of the cabin on the right side above the DEF (Diesel Exhaust Fluid) tank. You need to connect emulator wires of the four-wire cable that we mentioned in previous step to the pins of this plug. Disconnect the SCR plug, it has five pins. Two of five pins are gold plated, this is a CAN line. Now you need to connect the emulator wires to this plug (you can see the photos with connection scheme. If you have a new plug use it to solder emulator wires if you don’t have a free plug so please use the one you have on the truck, cut the wires and connect the wires of the emulator. If you hold the plug with both gold plated wires on the top you need to connect yellow wire of the emulator to the gold plated pin on the left. Connect the green wire of the emulator to the right pin of the plug. Bottom right pin used for ground connection (as we mentioned before you need to connect it first!) and the left bottom pin for power. Attention! 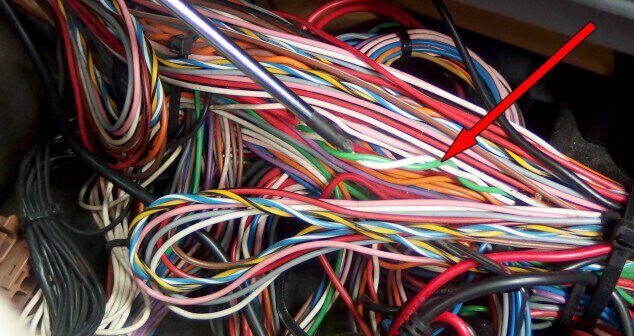 If you see that colors of the wires are different please check the signals with tester just to make sure everything will be connected properly. Connect the plug back. That’s it. Emulator is installed. 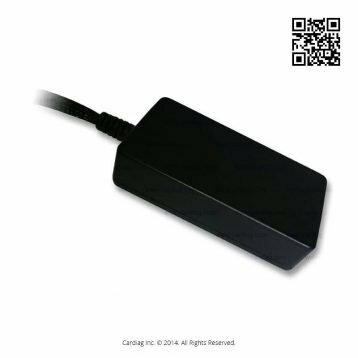 AdBlue Emulator V4 EVO installation manual for Scania Euro R730 was last modified: May 25th, 2017 by Cardiag Inc.